Did you know that in addition to their use in flying and for body warmth, feathers can be used to make noise, dig, act as sunscreen, help a bird sink, swim or slide, even function as snowshoes or a scrub brush?! 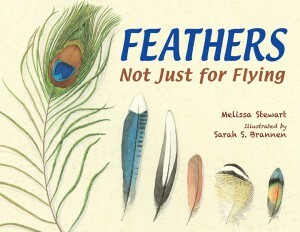 Kids can learn all there is to know about feathers in Feathers: Not Just for Flying, a gorgeous and informative book by author Melissa Stewart and illustrator Sarah S. Brannen. The book is laid out in a scrapbook style and highlights sixteen different bird types from around the world. The author explains different varieties of feathers and goes over their use. Brilliant watercolor illustrations feature true-to-life depictions of each bird, including close-ups of their feathers. Alongside there are pictures of everyday objects to help relate the unique feather capabilities to the job performed. This is a nonfiction book, aimed at the early elementary age group. The text and photos are well researched, and the author has done a great job making it engaging as well as instructional. In discussing the review copy with our child, we both deemed it enjoyable and worth having in our library, but one not likely to be re-read often. The publisher sent this book for review. In kindergarten, my kiddo did an expedition that focused on animal adaptation, and her group studied blue jays. She was particularly interested in why their feathers look the way they do, how they can fly, and how they use their crest to communicate. I think this book would have been a great resource!